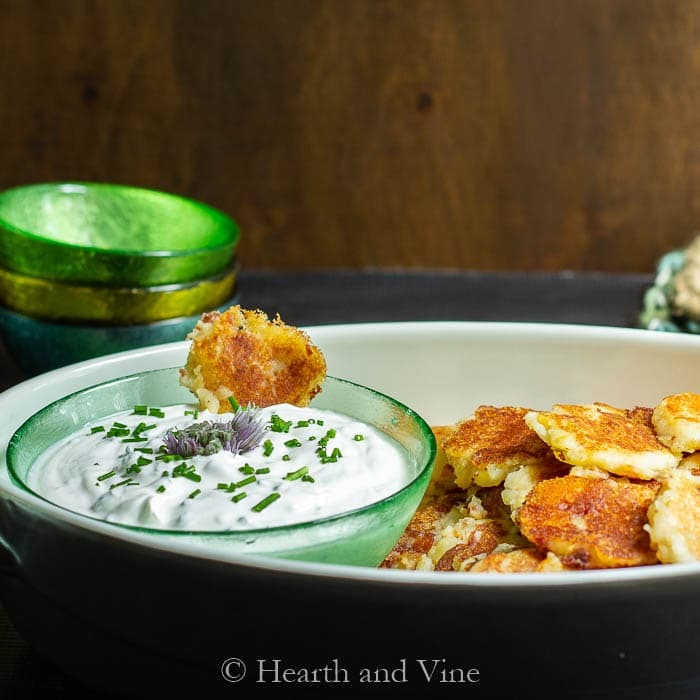 These loaded potato bites are paired with a tasty dip, giving you all the flavors of a twice baked potato in one tasty dish. I brought this appetizer to a graduation party. By the time we left, most of it was gone. I’ll take that as a good sign. If you’ve ever had a twice baked potato you’ll know what this yummy appetizer tastes like. 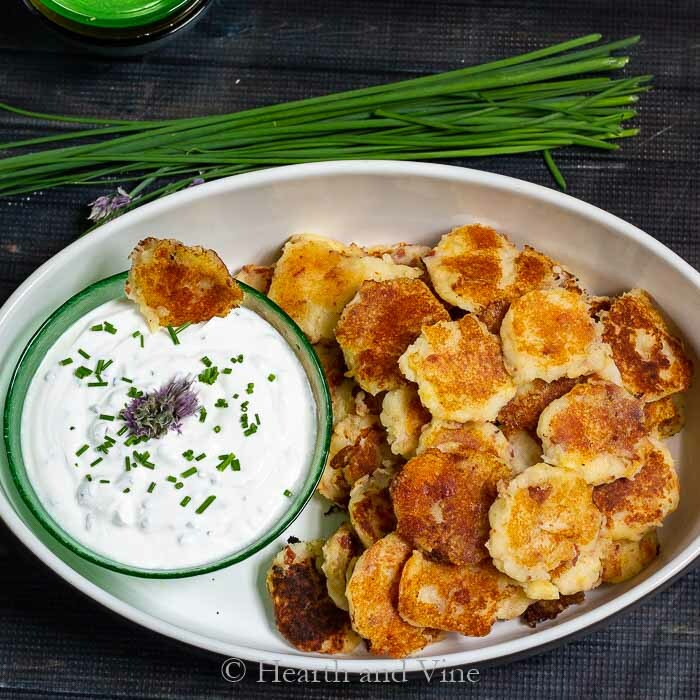 The difference here is the potatoes are shaped into potato pancakes and the sour cream and chives are the dip. I used sharp cheddar cheese for this recipe but you could use any cheese you like. Pre-cooked bacon is a big help in the kitchen. I did microwave it more to get it nice and crispy. Probably about 3 minutes for 7-8 strips, but that will vary depending on your microwave. Once it cooled I chopped it up nice and small for the potatoes. My only concern was that they were slightly soft. They were sturdy enough to eat with your fingers, but you might want to use a fork. These loaded potato bites are pretty small, about 1.5 inches in diameter and maybe 1/4 inch thick, and when you start with 3 pounds of potatoes you’ll end up with a nice platter of around 4 dozen bites. Plenty for everyone at the party. Peel, cut and boil potatoes until soft. Mash potatoes with butter and milk. Add cooked bacon and cheese to mashed potatoes. Set in refrigerator for 30 minutes. Mix sour cream and chives together for dip. Cover with plastic and refrigerate until ready to serve. Remove potato mixture from refrigerator. Heat a non-stick pan on medium-high heat with a little olive oil. Use a cookie scoop or small spoon to make small discs with the potato mixture. Fry in pan for 2-3 on each side or until golden brown. Remove to plate with paper towels to cool. Continue until all potato bites are cooked. Cover with foil and keep warm or serve immediately. Oh yum! I’m definitely going to have to try making these for our next family gathering. They look like a miniature potato pancake! So cute and of course you had me at cheese! Thanks CD. 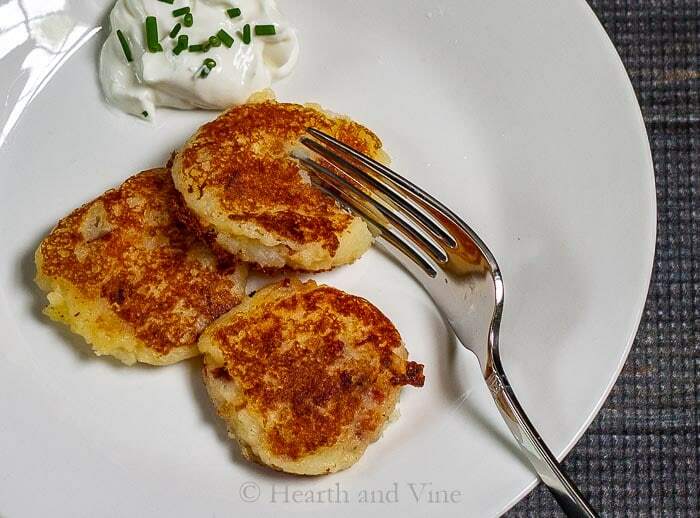 Yes, they are very much like potato pancakes. No added eggs but that might make them firmer. I’m not sure. I hope you like them as much as we did. Yum and easy, this is going on My Good Food Pinterest board. Something I can definitely make that doesn’t require a lot of space to create. I love living tiny but cooking has been a challenge. Thanks, this is perfect. Thanks Carole. They are one of those easy comfort foods most people like.